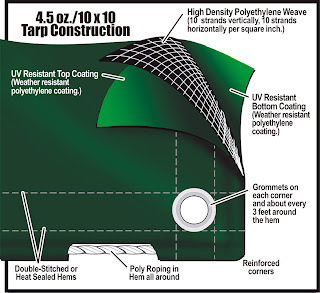 Tarps serve many different purposes, and people need them for different occasions. They come in different sizes to help suit the specific needs of different buyers. The many uses, including uses for natural disasters, will be discussed below. If one wants to see what is available when it comes to purchasing tarps, the internet is a useful tool. There are different selections for every event from summer outings for a family of one or for a large event like a fair. They come in waterproof materials so that an event will not be rained out. Other great features is that some allow some sunlight to come in so that people can still enjoy a nice summer day. The tarps come in different colors as well to suit the occasion. People might like to have a wedding outdoors, and the color can be chosen to help guests feel more comfortable. Since tarps are used for the outdoors and to protect those who come for the event, it is a great thing for those who might be affected by a natural disaster. If a group of coordinators need to set up so that they can service those suffering from a disaster, they can get a tarp to set up and shade themselves and their customers. There are many different sizes, and they are not hard to set up. A few helping hands can get one set up in a short amount of time to help their people quickly in time of disaster. One great invention is this item which provides protection and shade from the outdoors. It is removable so that events can be held quickly and with ease. It also helps those who use them to travel easily if their business is to go from one town to the next. The prices vary depending on the type of tarp one has bought. There are great extra features like tarps which have a walling, and they can even let sunlight through while leaving the bugs out.